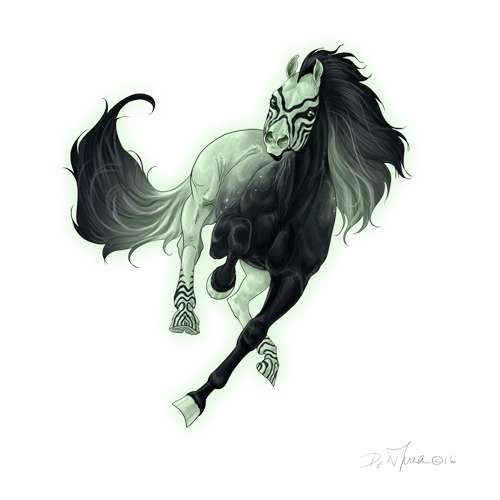 Asmoral is mostly compromised of two colours, an ethereal, glowing mint-green that is draped across her rib cage, hips, haunches, and hind legs, and a dark smoky black that runs across the majority of the front half of her body and the fringes of her tail. On her black face is an assortment of green swirls that match the glowing green of her body, said to be the fingerprints of whatever deity had forged her, and on her heels are matching swirls in black- the fingerprints of the demons that tried to drag her back into the depths from whence she sprang. In build, she can be decidedly petite but does not sway towards any particular breed. With blood of unknown origin, she has a rather straight, square head and small, curved ears. Her haunches are softly sloped, and her shoulders are smooth and missing the bulk of heavier breeds. Asmoral moves with a sort of unworldly grace, often with long, soft steps, and her head is often held high in defiance of her stature. For a time she had been made of dust and smoke, but now she is trapped within a body of meat and flesh, and the discomfort of becoming mortal has made her flesh itch and crawl, leaving her with a permanent scowl drawn across her face. Asmoral is a case of still waters running deep. She is an intellectual creature plagued with thoughts of paranoia and distrust. She quietly mulls over the thoughts in her head, assessing her surroundings and the behaviour of others, locking away what she has learned. Asmoral is a cheater and a liar- when given a task she often exerts more energy finding a way to skirt around the heavy lifting required of a task, or how to trick someone into thinking that she had completed it. She often harbors hostility towards those that have power or control over her, and typically disagrees with authority. Asmoral is rarely kind, and it can often be concluded that any kindness she exhibits can be a ploy or an attempt to get something that she wants or needs- it would be unwise to trust her. A liar herself, Asmoral has a strong aversion to others that lie, and will quickly grow suspicious of anyone that is either too truthful or too dishonest. Asmoral often exhibits a sort of hostility towards anyone that is kind or cheerful, and prefers to opt to try and manipulate those that are too 'simple'. She looks down upon those that believe in the betterment of horsekind, and dreams of watching the world burn. There had never really been a point at which she had remembered coming into existence. First there had been dust, and then she had simple become. She remembered the swirling abyss that surrounded her for what must have been millenia before she had been torn from the smoke and deposited onto the planet. The first time she had stepped through the green mist onto the planet had been unimpressive and quiet, she had stared at her captor and he had stared back at her before dismissing her for another few thousand years. For eons she had swirled through the darkness, stewing over her next ethereal birth and how she would make an impression next time. Body-less voices around her whispered of lucky souls that were left to the nether, their names forgotten and their existence fading away into nothingness. She had been jealous of them, she had wanted so badly to be forgotten. The real world burned her, it stung at her flesh and it had made her bitter. Even for those short, few moments she had been stuffed into a body of meat and bones. Fourteen more times she had been summoned. Never did she linger long, once she listened to the whispers of the shadows, telling her to devour her captors. Sometimes she had completed their tasks, only to be dismissed until she was summoned again- other times there had been a flaw in the circle drawn around her, intending to contain her- and she had swallowed them whole. The last time had happened only three days after she had been summoned before. Once more she rose from acrid green smoke, fangs protruding from her lips and spikes bristling from her spine. Limbs jutted out in unnatural directions- and yet there had been nothing. No one to greet her or control her, and nothing greeted her but the misty darkness of a cavern- an obscure scuff mark etched into the edge of her circle. So she had stepped out of it. The moment she had, the pain left her skin, and the air did not burn her flesh as it had before. Narrow eyed, she noted that her extravagantly morbid form had grown soft and smooth, green and black, and she had lost the dustiness of her body. Once made of clouds and ashes and darkness, She found herself anchored to this world, locked up in a meaty body and angry about whomever had cursed her to remain here. So she wandered- and she wanders still. At its lowest level, Asmoral is able to create ghost-like copies of herself. They are not physical and appear much like well-formed smoke. The features can be distorted, and the duplicate does not always wear the same face as her. 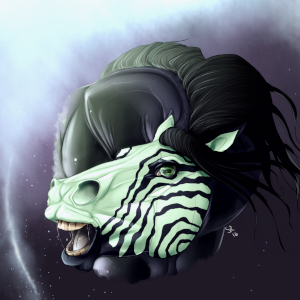 Though easily mistaken as another horse, it is noticeable that the duplicates are not the mirror image of Asmoral. They can only create sounds such as grunts or chuckles, and cannot communicate verbally. With illusions, Asmoral can create small 'summoning spells'. She is able to sew images of small animals and can sometimes materialize small flora, creating the sensation of being blocked or barred from moving forwards. With much concentation, she is able to perform vanishing tricks, and will reappear a short distance away. As these powers grow, she will be able to create more elaborate illusions and disappear for longer periods of time. Asmoral's flesh is not entirely made to be solid. Most of the time she is, and when she is in a mode of being intangible, she is like smoke. She cannot be touched, and with more strength and concentration someone will be able to pass almost entirely through her. Her cuts and wounds do not manifest as blood, but instead she spills ash, or sand-like substances. These will drain and harm her just as real wounds would. As she grows stronger, her body will be almost entirely compromised of a smoke-like substance, and it will take concentration for her to become solid. Any manipulation of her tangibility causes her a burning sensation. More credits to come as images get used. TRACKER | PLOTTER | Send Asmoral a private message.